Warning: Spoilers for books 1-3 possibly in blurb and review! Lady Alexia Maccon, soulless, is at it again, only this time the trouble is not her fault. When a mad ghost threatens the queen, Alexia is on the case, following a trail that leads her deep into her husband’s past. Top that off with a sister who has joined the suffragette movement (shocking! ), Madame Lefoux’s latest mechanical invention, and a plague of zombie porcupines, Alexia barely has time to remember she happens to be eight months pregnant. More and more with this series I find myself both really enjoying and kind of not enjoying it. 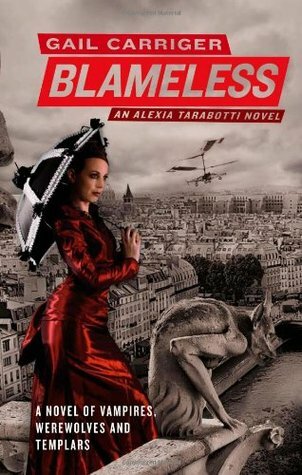 Heartless had me completely enthralled for the first 200 pages or so but then it got to the action bits and the climax and I sort of lost interest. I think I just don’t care for the way Carriger writes her action scenes but the build up is always a lot of fun. As always, Alexia was delightful. I loved how it was obvious to everyone the pregnancy was effecting both her brain and her body but she refused to see it. It seems like something Alexia would do. She couldn’t believe she could change simply because she was pregnant even though she was definitely more forgetful and emotional. I really enjoyed seeing this side of Alexia. Lord Akeldama and Floote were just as charming as before, too. Carriger has no problem building and maintaining interesting characters and I’m very glad to see this. However, Lord Maccon was absent just a bit too much in this novel for my liking, especially considering the previous novel had Alexia and Lord Maccon fighting and not being together. 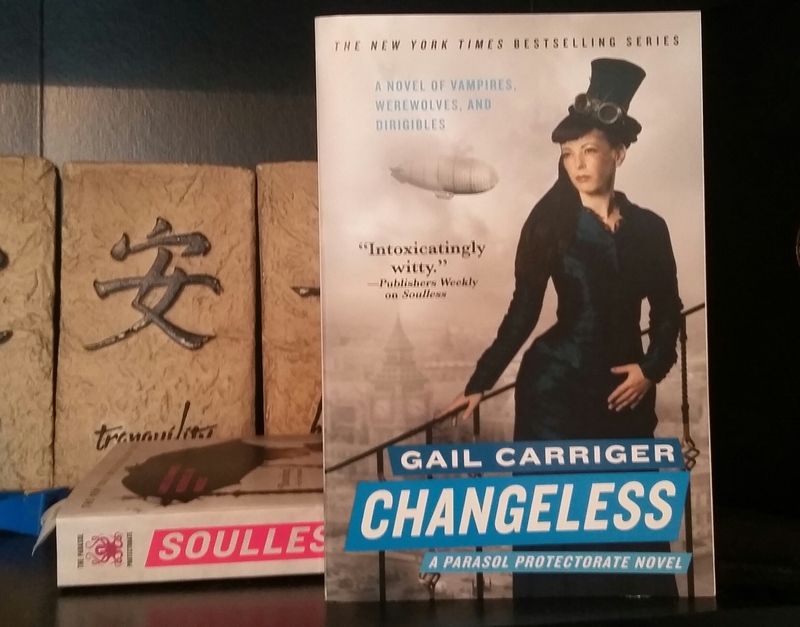 I still really enjoyed this novel and once I have a small break from the steampunk I’m excited to read the final book in the Parasol Protectorate series. Warning: Spoilers for the first and second books possibly in blurb and review! I liked that there was more action. I liked that Alexia’s views on life and herself didn’t change because of the baby but I also liked that she was emotional. Well, as emotional as Alexia can get. She cried and was upset about what happened with Conall but she was still practical and independent. As usual I loved all the side characters. Madame Lefoux was hilarious and charming but still a bit mysterious. I also hold that Floote is still by far my favorite character in the series. The plot was better this time and I definitely liked this ending more than the last one. I can’t really complain about much. Then why only a four folded page review you ask?? That’s because something just felt kind of off for me. I liked the plot more. I liked that Alexia had more action but it also felt slow. Overall the characters were still mostly themselves but I think some of the characters had minor out-of-character (OOC) moments mostly stemmed from the OOC moments in Changeless and I didn’t enjoy that. For me, this is a solid installment in the series but so far none of the sequels quite live up to Soulless. This book made me so incredibly angry. So angry in fact that after finishing this book at about 9:30 at night I couldn’t sleep. I dozed but woke up still super angry and unable to get back to sleep. I had to spoil the third novel in the series for myself just to get some shut eye. That’s how angry this book made me. I won’t give any spoilers and the part that made me mad is such a shock that even though it made me incredibly angry my anger shouldn’t give an a hint as to happened. That being said, I do suggest NOT reading the blurb to Blameless unless you’ve finished Changeless because the blurb contains said angering thing. Aside from being incredibly angry at this book I enjoyed the plot. I like the changed dynamic between characters that will go unnamed and even the character development of Alexia and other characters was amazing. I do think this novel was a lot slower paced which is part of the reason this book didn’t get 5 folded pages. (Did I mention how incredibly angry I am??) I felt like the main action of this novel didn’t nearly equal that of Soulless and I’m saddened by it. I did still enjoy reading it though and aside from the incredibly angering part felt it was a good, solid sequel. I’ve already ordered the ebook of Blameless from my library’s overdrive because I honestly can’t wait until I’m able to buy the paperbacks or for my library to order a physical copy from another in the system. Warning! : This book does contain some parts that aren’t for readers under 18. I LOVED this book. No seriously. I didn’t go into it with high expectations. I don’t usually care for adult novels and the first 10 pages I was seriously worried Alexia would annoy but honestly it’s one of those books that I already want to reread. Soulless had me smiling like an idiot into the pages. I kept wondering if people were looking at me while I was reading because I literally had to stop myself from giggling while in the quiet car on my way to and from work and it ended up sounding like I was choking. But moving past fangirling, I loved the way Carriger wrote this. I’m not a huge fan of third person but the way she writes it barely bothered me at all. And while it was omniscient, there were still super suspenseful parts where I NEEDED to know what happened but the current focus was still just as good. 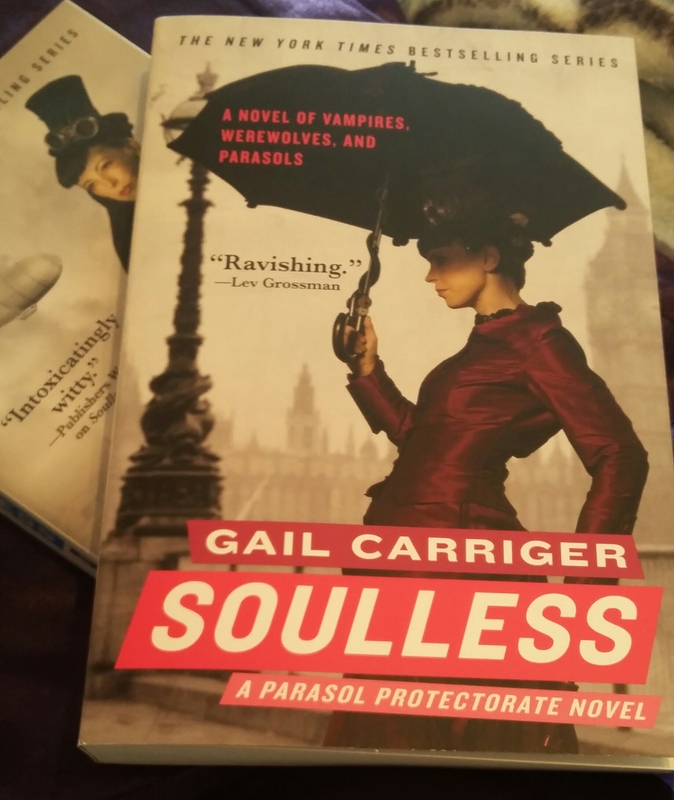 Usually, I find that with books that switch POVs or are in third person omniscient, I lose interest if the focus goes somewhere else so the author can try to create suspense but that definitely didn’t happen with Soulless. I also loved all the characters and boy does Carriger know how to create characters. I mean, I felt myself falling in love with even Floote the trusty butler who barely has more than a few paragraphs devoted to him. As you can see by my obsessive (and probably incoherent I’m sorry) fangirling, I really loved this book and I can’t wait to pick up the others in the series. I’m super excited to read about the world in general since she has a Young Adult series built in the same world as well and a spin off from the series about a separate character! So far the world and how the book is written kind of reminds of Deanna Raebourn’s Lady Julia series. I love that series and reading this is making want to reread that since it’s been so long. What a great way to pull myself out of the beginnings of a reading slump.